(CNN) -- Evangelical pastor Ted Haggard described Thursday as "fundamentally true" an assertion that he engaged in an inappropriate relationship with a 20-year-old male volunteer in 2006. 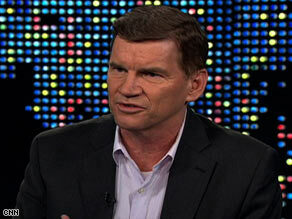 Pastor Ted Haggard acknowledged on CNN's "Larry King Live" that he had a second relationship with a man. "He pretty much asked me if it was OK if he masturbated in front of me or masturbated in the bed next to me," Haas said. "I told him no, it would make me really uncomfortable. But he grabbed a bottle of lotion and started masturbating." Haas added, "(Haggard) used to say to me, 'You know what, Grant, you can become a man of God, and you can have a little bit of fun on the side." In the CNN interview, Haggard credited Jones with having helped him by disclosing that information. "I think he rescued me. I'm very grateful to him," Haggard said. He said he would have lost the support of his wife of 30 years, Gail, and their five children "and been a drug addict" had he not been caught. "Many of the charges against me are exaggerated, but it doesn't matter," Haggard told Larry King. "I'm guilty enough of so many things." Asked if he has engaged in inappropriate conduct with any other men, Haggard did not give a direct answer, saying only, "I have thoroughly discussed all of my sexual history with my wife and my therapist and, to some degree, the family, and we think that's an appropriate boundary for that." "I think I'm still deeply wounded and scarred and somewhat confused," he said. About other men, he added, "I have thoughts from time to time, but not compelling thoughts." Nevertheless, he said, "Today, I'm 100 percent satisfied with my relationship with my wife, and I have no compelling things in my life toward others." She said the two had "a great sexual relationship in our marriage ... throughout marriage." Asked if he wants to return to the pulpit, Haggard said, "I think Gail and I both want to tell our story to the degree that it's helpful to other people. I don't know that that would mean a pulpit, but certainly I'd be interested in public speaking." His appearance Thursday coincided with the debut of an HBO documentary called "The Trial of Ted Haggard."